Over the past years, we have witnessed how robotic automation has combated different processes in various industries. These efforts have superseded the normal human workforce activities to a great extent. But, the methods and the complexity of tasks they can perform within that environment has increased dramatically in recent years. From performing repetitive tasks that are required for production to health care assistance, robots have served innumerable areas. For instance, SDVs (self-driving vehicles) and other forms of automation create significant improvement of efficiency in production. It is a fact that humans cannot magically learn from a single demonstration. But researches show that robots can successfully carry out 87.5 per cent of all the tasks that are given to it. On time and on its own. The researches also show that when a human operator was allowed to correct minor errors in the interactive robots, its accuracy rose to 100 per cent! This shows that robots are adaptable and interactive. Collaborative robots help in finishing off the tasks in very less time with human collaboration! Robots typically have powerful, heavyweight automated arms that perform tasks such as welding and other coarse tasks. They can help prevent injuries or adverse health effects such as musculoskeletal disorders and injuries to human workers. Physical and mental exhaustion can be reduced with the use of robots. Injuries from lifting and moving large objects are some of the most common causes. Risk assessments are crucial because of possible accidents in the warehouse. Robots, to a great extent, ensure employee safety and job security. Many of the production lines place stress on employees thereby increasing the chances of injury. In these cases, robots are programmed to avoid risks to the employees. Robots streamline processes and increase part accuracy, which means minimal material waste for your operation. In every industry, speed and efficiency are key factors. In addition to savings on the cost of labour, energy savings can also be significant due to lower heating requirements in automated operations. Overall, using robots for materials handling should provide a higher output for a lower cost. Wisely said, there ought to be a positive ROI for a successful business. But automating functions like material handling has to also create a better environment for workers while keeping cost-effectiveness in mind. Over the next three decades, statistics show that more than 76 million baby boomers will retire and only 46 million new workers will be available to replace them! During this time, the demand for labour will rise, making automation a real and viable solution! Job security is always a concern among union employees when the idea of robots is discussed. To enhance the employees’ work, for instance, can be with the materials handling function, where machines can perform tasks that are repetitive or even dangerous for employees. These robotic services serve to improve employee satisfaction. With increased system flexibility, robots can be easily retooled and repositioned for new production programs. Since they are flexible and can easily be redeployed in new applications, robots have found a wide array of opportunities in various industries. Robots also allow companies to maximize their employees’ skills. There is already a shortage of skilled workers within many large sectors of manufacturing. 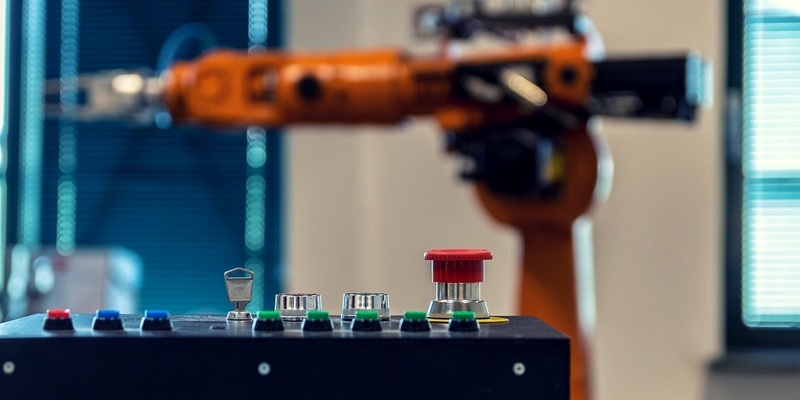 Robots have the ability to easily switch between a wide range of products without having to completely rebuild production lines. Robots follow a Mixed-flow production approach which also allows for flexibility in adjusting to demand fluctuations. Robots are able to constantly learn and adapt to new processes. They considerably reduce the required changeover time. Also called Musculoskeletal Disorders, Repetitive Strain Injury results from performing the same tasks repeatedly, especially at high speeds. This results in swelling and cramping. When performed continuously at high intensity for longer periods of time, it becomes a chronic disorder! In 2012, the manufacturing industry had the fourth highest number of MSDs, with 37.4 incidents per 10,000 workers. In such cases, robots are perfectly suited for completing repetitive tasks. Industrial Welding involves noise, intense heat, and toxic fumes. These are potentially hazardous substances. Underwater Exploration is another scenario. For instance, the Undersea Exploration Robot, named Sentry is capable of rudimentary planning in unpredictable environments. Robots have been tested for a wide range of emergency response applications, which includes dealing with wildfires, floods, and other situations. An example of this is the robot that was created using “robotic swarm” technology for Avalanche Rescue. This would be an especially valuable application for robotics, since avalanche victims may die in as little as 30 minutes. Robots are also used in Deep Sea Exploration. In 2011, the Robonaut 2 became the first humanoid robot to make it to the International Space Station. Automated technology allows you to decrease the cost per units at the same time of improving quality. This allows you to compete in a much better way in the global scenario. Due to the immense contributions of robots in tasks that humans find hard to perform, robotic automation contributes to employees health in mammoth proportions! !